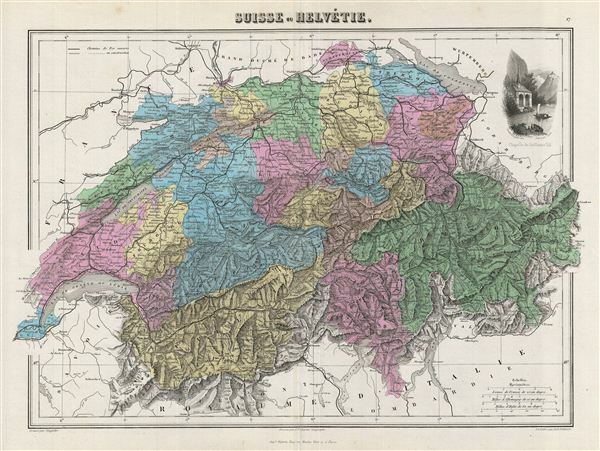 This is a fine example of J. Migeon's 1878 map of Switzerland or the Helvetic Republic. The map covers the entirety of Switzerland divided into its constituent Cantons from Vaud to Grisons. The upper right quadrant features a beautifully decorated illustration of the Chapel of William Tell. After the creation of a federal constitution in 1848, Switzerland underwent a period of rapid social and economic development. The cantonal currencies were replaced by a single currency (the Swiss Franc) and many of the cantons subsequently established representative governments and instituted freedom of the press and trade. Migeon identifies Migeon identifies various railwaylines, rivers, mountain passes, lakes and other topographical features. Migeon's Geographie Universelle, published in Paris, is one of the last decorative atlases produced of the 19th century. It contains many stylistic elements of early 19th century cartography such as full hand coloring, numerous decorative vignettes, and high quality paper. This map was issued as plate no. 17 in Migeon's 1878 Geographie Universelle. J. Migeon (fl. c. 1855 - 1899) was a late 19th century map publisher based in Paris, France. At various times Migeon maintained offices at76, Rue de la Harpe, 34 Rue du Chemin des Plantes, and 11 Rue du Moulin Vert, all in Paris. His most prominent publications are the Geographie Universal in 1854 (updated through 1874) and the Nouvel Atlas Illustré de Géographie Universelle in 1891. Little is known of Migeon's life and even his first name is uncertain. Migeon, J., Geographie Universelle (Paris) 1878. Very good. Original centerfold. Blank on verso.